It is the epitome of excellence in the poker world. For almost four decades now, the World Series of Poker has crowned champions and, along with the cash for winning the event, awarded the victors further awards in the form of a gold bracelet. 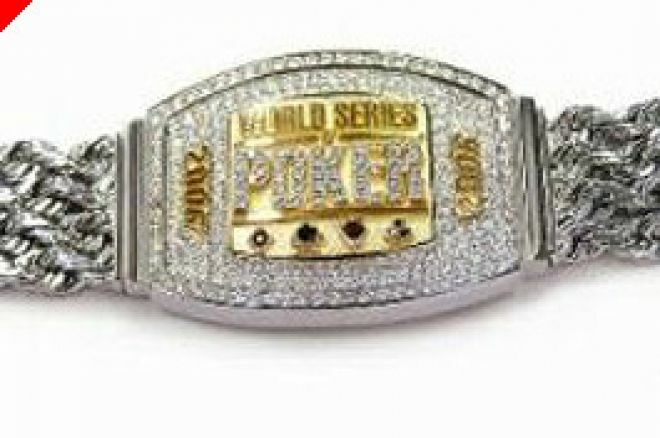 These bracelets not only recognize the achievement of winning a WSOP tournament but also have become the benchmark of success in the poker community. On June 6th, Harrah's displayed for the first time the awards that will be available once the events start on June 25th. "It's impossible to overstate the value of a World Series of Poker gold bracelet to anyone who takes the game seriously," stated World Series of Poker Commissioner Jeffrey Pollack during the unveiling. "It is the equivalent of winning the Stanley Cup in hockey or the Lombardi Trophy in football. As such, the champion's bracelet at the 37th Annual World Series of Poker will be the best ever, something the winner will take pride in for a lifetime." The schedule of events at this year's World Series has forty five events and, for forty four of them, the bracelet will be special. Each winner of an official event during these events will receive a bracelet constructed by Triton Jewelry, a division of Frederick Goldman, Inc. These bracelets will be made from 14-karat yellow gold and accentuated by full cut white diamonds. The center plaque of the bracelet will have one-third a carat of diamonds and be held together by thirty five grams of solid diamond cut rope chain. While these bracelets are exquisite, the World Champion's bracelet will most definitely outshine it. The bracelets that have been created for this year's tournament are quite special, befitting the achievement of beating the best players in the world to win one. We'll see who gets these pieces of jewelry in just a few weeks as the World Series gets ready to start. Countdown To The World Series of Poker, Part Four: H.O.R.S.E. Countdown To The World Series, Three: who is Favored?